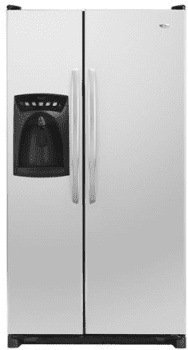 OVERALL: The Amana ASD2625KES Side by Side Refrigerator, has a huge 25.6 cu. ft. capacity and most of it is 100% usable storage space. For under $1,500.00 you get a stainless steel side by side refrigerator that will last you for years to come. We loved the overall look and feature set of this fridge. And because it comes with the Amana brand, you know the quality will be there. The Amana ASD2625KES was recently featured as a Consumer Reports Best Buy. The Temp-Assure® freshness design from Amana does an excellent job of keeping an accurate temperature throughout the fridge. *We found the 5-button electronic FrontFill™ dispenser easily fills tall containers with filtered water, ice - or both at the same time PuriClean® II retractable water filter is a snap to change and saves on bottled water costs. *Auto night light means no icy surprises at 3 a.m.
CONS: There's not a lot to complain about on this particular fridge. We did notice however that the crushed ice feature on the icemaker was a bit slow to deliver. Additionally, it would be nice if the stainless steel panels wrapped around the sides instead of using black. Either way it's still an attractive fridge. One consumer complained that the temperature setting is a bit sensitive and that if items are placed too closely to the fridge's air flow system, they can freeze. MSRP: The MSRP of the Amana ASD2625KES was $2,400.00 but at this point Amana has discontinued it and is no longer making this model so we would expect you won't be able to find it in stores anymore.